If you’ve never had a warm winter margarita, you’ve been missing out. 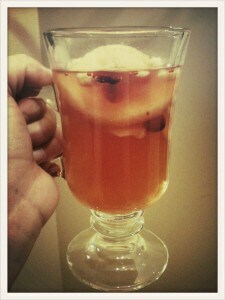 It’s basically a tequila hot toddy! Warm margaritas are boozy and comforting, and an easy-to-make drink that’ll be sure to please your guests all winter long. 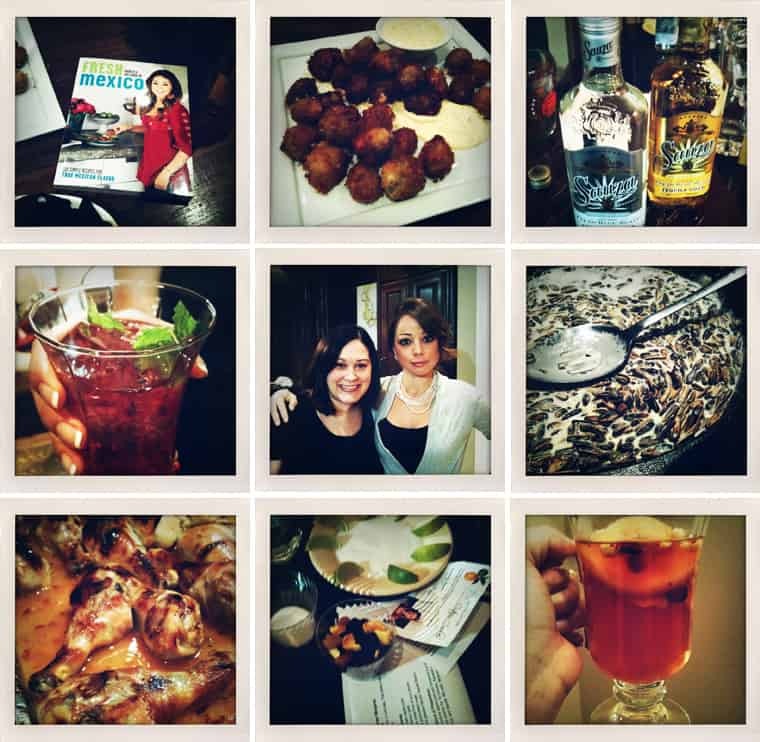 I attended a Ladies’ Night In party in Chicago with Chef Marcela Valladolid, cookbook author and host of the Food Network’s “Mexican Made Easy.” We sipped and sampled numerous Sauza Tequila drinks and had a fantastic time tasting dishes from Marcela’s cookbook, Fresh Mexico. One of the drinks Marcela showed us how to make was this warm winter margarita. It was an instant hit with the crowd and the perfect way to end the evening. It was so much fun to hang out with her for an intimate evening of cooking tips and getting to taste some of her recipes! Thanks so much to Sauza and Chef Marcela for a fabulous Ladies’ Night In. And thank you to the hostesses, Stacey Roney and Beth Rosen for inviting me! I had a great time. Each party attendee received a little tequila to practice making their own drinks as well as a copy of Chef Marcela’s book, which I really like and would recommend as a gift for yourself or the Mexican foodie in your life. I’ve already made this recipe a few times and several other recipes from her book and I’m definitely impressed. They taste very similar to the Mexican food I make in my own kitchen. Click on the English or Spanish-language image of the book below to purchase that version. Combine apple juice or cider and cinnamon sticks in a deep pot. Bring to a boil, then reduce heat and simmer for 10-15 minutes. Remove cinnamon sticks. Add sugar and tequila and stir to incorporate. Pour into cups and add dried fruit to each cup just before serving so they don’t rehydrate too quickly. For added fun, you can sugar the rim of the glass if you like. Just gently wet the rim of the glass and dip it in a small dish of fine granulated cane sugar before pouring the margarita into the glass. If you’re looking for other hot drink recipes to make your holidays a little more Mexican, check out Abuelita Elda’s ponche Navideño, a staple during our family’s holiday celebrations. I LOVE Marcela! Wow! How exciting that you were able to meet her and taste her recipes made by her!!! I have a similar drink that I make but it’s made with pear nectar —- oh so yummy! I will be posting it for the holidays. Have a happy Thanksgiving! Looks like you had a great time at this event and this recipe definitely kicks up the traditional cider!